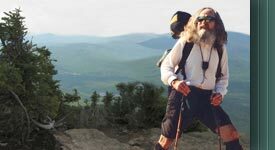 Nimblewill had long pondered concluding his long-distance hiking “career” with the past-year’s journey, Odyssey 2013. However, after much encouragement from family, friends, and fellow intrepid (and with the Lord’s continued blessings--good health, stamina, and resolve) he’s decided to keep trekking on. And so, for Odyssey 2014, he took another journey back through time, as he thru-hiked one of the greatest trails in the annals of American history, the Oregon National Historic Trail. And that trail? Well, first there were game traces, then Indian trails. Then came the mountain men, the trappers, the missionaries, and finally the pioneers. 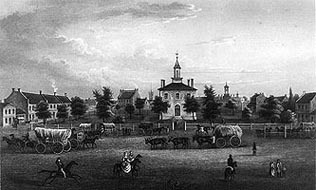 From the 1840s through the 1850s, over three-hundred thousand emigrants wearied their way from Independence, Missouri, to the great valley of the Willamette, in the Oregon Territory. 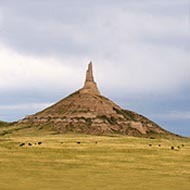 In addition to Missouri and Oregon, the trail passes through Kansas, Nebraska, Wyoming, and Idaho, a distance of some 2,200 miles. From the Midwest to the Far West, its deep, furrowed ruts epitomize the pioneering spirit. To the eye, the tracks appear hollow, yet to Nimblewill they are known to be filled with romance and adventure, sorrow and joy, triumph and tragedy--transcending time. In many places those old ruts still mark the land and can be walked today, as did the pioneers nearly 200 years ago. Nimblewill plied those tracks as he crossed the prairie, forded the rivers, climbed the mountains, entered the valley. He saw and told of the landmarks, visited and photographed the many historic and hallowed places along--all while passing countless graves marking his passage. It was destined to be a journey of true adventure and intrigue. Nimblewill began this journey by setting out from Independence, Missouri on April 28. On Sunday morning, August 24th, he arrived End of the Oregon Trail Interpretive Center, Oregon City, Oregon, successfully concluding his thru-hike o'er the Oregon National Historic Trail -- 117 days, 2,109 miles. "This proved a long and very difficult journey. Thanks to all for your encouragement, support; the success of this hike I owe to you!" When the West was an infant child. Their cares to the wind and the wild. Were set to rest in the sod. Through ruts worn weary and long. Passed this destined, fateful throng. They journed toward the Promised Land. Their past in the shifting sand. On the trail to a brand new dawn. Yet to this day, do the brave there stay! Born new from the pioneer age. Past the land of the purple sage. On that trail with those brave and strong. For those days do I yearn and long. * The Last Rose of Summer began as a poem by an Irishman named Thomas Moore (1779-1852). Moore wrote the poem in 1805 and, two years later, it was set to music by composer Sir John Andrew Stevenson (1761-1833). The Last Rose of Summer is listed as a--tune for dancing--in the book "Songs and Dances of the Oregon Trail” by Phil and Vivian Williams. This somewhat melancholy fiddle version typifies what the pioneer families no doubt listened to as they drifted off to sleep after another long and tiring day on the trail. 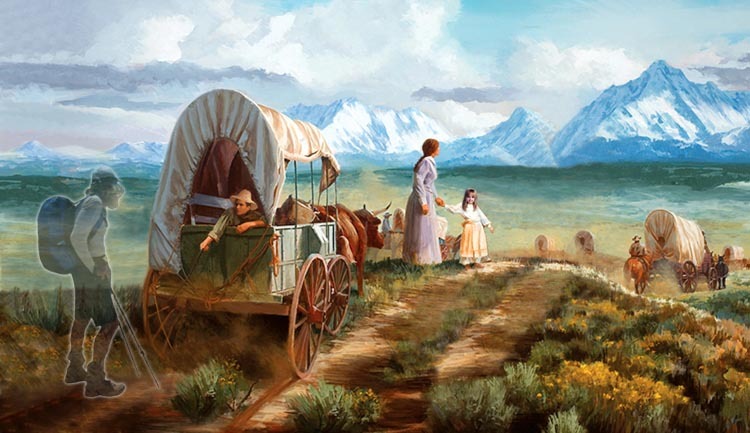 As we close our eyes and listen, might we envision that special, long ago time, the gentle lowing of the oxen, the circle of wagons, the campfires--out under the stars on the Oregon Trail.